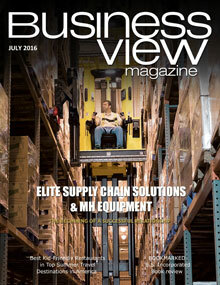 Business View profiles Mississippi Coast Coliseum & Convention Center, a multi-purpose entertainment arena and a venue for conventions and trade shows. In 2005, when Hurricane Katrina slammed up against the Gulf Coast of the Southern United States, it did a great deal of damage all the way from Central Florida to Texas. One of the places the storm hit hardest was the Mississippi Gulf Coast, where the Mississippi Coast Coliseum & Convention Center sits midway between Biloxi and Gulfport. While many places suffered from Katrina’s wrath, the Mississippi Coast Coliseum & Convention Center was particularly ravaged, according to Matt McDonnell, its Executive Director, who has spent the last three decades in service to the facility. “Everybody read about Hurricane Katrina hitting New Orleans,” he begins. “New Orleans certainly took a lot of damage; it was a catastrophic event for their community and for many of their facilities. But theirs was basically a breach of levees that caused flood water to enter the city, stay for a number of days, and then exit. Hardly was the renovation complete, however, when the Deepwater Horizon oil spill – the world’s largest accidental spill at over 5 million barrels – covered the same gulf coastline for 87 days, putting a further two-year damper on Gulf Coast business. “Not only did we take the hit from Katrina, but we also took the hit from the BP disaster. Maybe not to the same extent that other communities did, but we did feel the economic downturn in 2010 and ’11,” McDonnell says. The good news is that, today, the largest beachfront facility of its kind in the South is doing well. “The last two years of our operation has been very good in terms of revenues and numbers of events that we’ve been able to generate for the facility,” he reports. 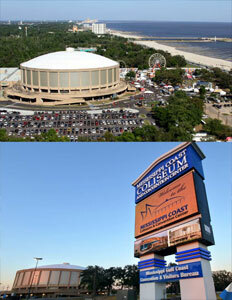 The Mississippi Coast Coliseum & Convention Center was created by legislation in 1968, and originally funded by a two percent food, beverage, and lodging tax imposed in Harrison County, Mississippi, where Biloxi and Gulfport are located. According to McDonnell, the Center is neither a privately-owned nor municipally-owned facility. “We’re very unique in the sense that we’re a political subdivision of the State of Mississippi, he explains. “We are like a city within the city of Biloxi – kind of like the Vatican is to Rome,” he quips. The Center operates under a seven-member Commission which is appointed by members of the Harrison County Commission, the mayors of the cities within the county, and the Governor of Mississippi. Its operating expenses are required to be generated by its revenues, while its debt service for capital expenditures is being paid for with a two percent hotel lodging tax. Today, the Mississippi Coast Coliseum & Convention Center has about 30 full-time employees and as many as 600 part-timers “in any given year, depending on the peaks and valleys of our booking cycle,” says McDonnell. In addition to the many outdoor fairs, festivals, and events the facility hosts, the Coliseum plays host to Broadway shows, world-class musical acts, professional comedians, sporting events, rodeos, truck races, and the like. Its particular niche is family shows such as Disney on Ice (it’s the only facility in the region with an ice floor), the Harlem Globetrotters, and the Ringling Brothers, Barnum & Bailey Circus. The Coliseum also holds one of the largest crawfish festivals in America, over two weekends every April. Meanwhile, the Mississippi Coast Coliseum & Convention Center hosts trade shows, major indoor events, conferences, graduations, etc. “It’s not uncommon for us to have five or six different events going on at the same time on site, either on the grounds, in the arena, or multiple events going on in our convention center,” says McDonnell. This time of year is particularly busy, as the Center is in “graduation mode” according to McDonnell. “We’ve got the largest community college system in the country located here in the State of Mississippi and they’re holding their annual commencement that will attract over 9,000 guests and over a thousand graduates. We’ll have a college graduation taking place and then about a dozen high school graduations that will be spread out over two weeks,” he reports. Meanwhile, some updates recently have been made to the Center in order to keep it attractive to potential bookers, with more renovations on the drawing board. “We’ve gone to fiber optics within the facility,” says McDonnell, “based on the demand for the amount of data that’s being transmitted for various consumer shows and conventions that are currently utilizing our facility. So, now the building is fully wired with fiber optics, and we see other technological advances that we’re going to have to make to stay competitive. From the arena standpoint, our arena is an aging facility – it was opened in ’77 – and while we’ve done some renovations to the facility – seating, lighting, dressing rooms, lobby, restrooms – the amount of technology that we can bring to the arena is limited to a certain extent,” he adds, ruefully. Still the crowd favorite, it’s little doubt, that with the acquiescence of Mother Nature and with the good works of man in the offing, for the Mississippi Coast Coliseum & Convention Center, those fruits are apt to be sweet, indeed. Check out this handpicked feature on The Greater Columbus Convention Center.